This entry was posted on September 21, 2012 by christinerobinsonart. 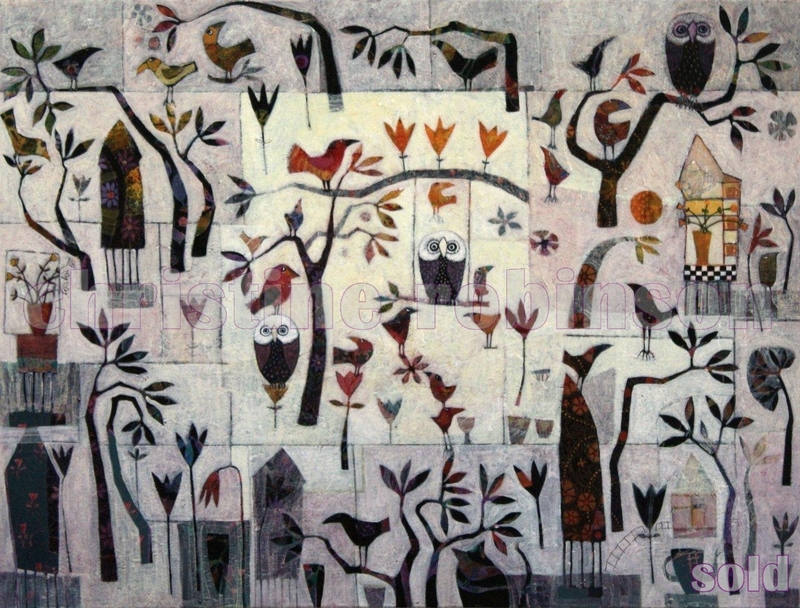 It was filed under Art, Australian Art, Christine Robinson, Feminine Art, Whimsical., Woman Artist and was tagged with artwork, bird art, Cat Art, cat painting, child within art, Enchanted Forest, flower art, flower painting, Landscape painting, Little House painting, mixed media, Moon Art, Mt. Warning, Owl Art, Owl Painting, tea pot art, Teapot Painting, Topsy Turvy, Tree Art, trees painting, whimsical Houses. Hi Christine, these latest images have a certain mysterious atmosphere about them, a silence amongst words (that must be due to the white/grey background). And punctuations too, like a script.